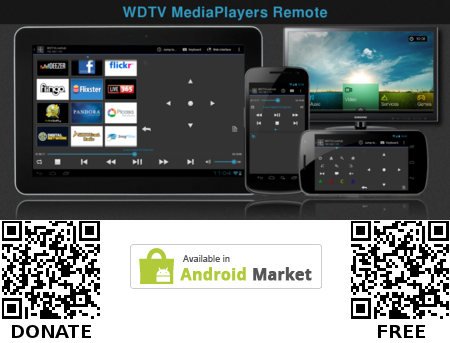 WDTV MediaPlayers Remote allows you to control WDTV devices via WiFi connection and is available for FREE or DONATE versions on the Android Market. - Physical buttons of your device, as trackball, "back" and "search". - Full new version, reworked from the ground up. - New user interface with \"Ice Cream Sandwich\" style. - Tablet support (Android 3.0+) and new landscape mode for all the devices. - Improved compatiblity with Android 4.0 Ice Cream Sandwich. - New uPnP controls: Seek bar, volume control, play mode, and status info. - WDTV devices auto discovery and device manage. - New supported devices: WDTV Live Streaming. - New internet services control for WDTV Live Hub and WDTV Live Streaming. - New more stable connection. - Partial support for official firmware on WDTV Live and Live Plus (version 1.04.20+). - Full keyboard support for WDTV Live Hub and Live Streaming. Still on beta for others. - New voice input. (Requires Google speech recognition). - New step by step guide. Check Help menu. - This version requires Android 2.1 or higher. - Fixed issue on Android 1.5 devices. - Ad free donate version now available on the Adroid Market (Please support us downloading it). - New lock mode to use only the hardware buttons. - New keyboard shortcut on the menu. - New option to open the gesture panel by default. - New help menu on the main screen. - New icon and help menu about the IP address. - Improved the user interface structure. - Improved the compatibility with Android 3.0 Honeycomb. - Improved the application stability. - Fixed bug that doesn\'t show error screen with bad IP address. - Fixed bug that doesn\'t allow tap on text links. - Fixed bugs that causes FC\'s on low end devices. - On screen Keyboard (BETA). - Shake control. (Shake to Play/Pause). - Check if the WiFi network is active before connect. - The screen can be always on. - App2SD (Only for Android 2.2+). - WDTV Live Hub aditional functions. - New buttons for WDTV Live Hub. - Down bar size increased. - Application icon quality improved. - Donate button to help on the application development. - The connection process can be canceled. - Volume control improved (Only WDTV Live). - The connection doesn\'t stop on minimize. - Improved compatibility with Android 2.3 (Gingerbread). * I know my english is not the best so any correction on the app translation is welcome. Last edited by juliojs on Wed Feb 15, 2012 11:32 am, edited 7 times in total. I will get an android phone soon so i will try it out asap. It's nice to see people interested on it! Nice app! Gonna try the next days... already installed it on my milestone. recliq wrote: Nice app! Gonna try the next days... already installed it on my milestone. Great! Don't forget to rate it. I'm sorry, but by the moment it will be only available for Android. In the future I'll think about port it to other mobile OS or release the code, but iOS it's not planned due to disagreements on SDK and AppStore license. Of course! A config menu is on TODO list. thank you for the suggestion and for rate it! Can you include profiles for diferent devices? wd_pepper wrote: Very Nice App !